Dr. Stewart’s research interests have continued to focus on the endothelium in health and disease. Upon his return from fellowship training, he established a vascular biology laboratory at McGill University, focused on the elucidation of the role of endothelial factors in vascular health and disease. He was the first to measure levels of the vasoconstrictor factor, endothelin-1, in patients with cardiovascular diseases, and identified that pulmonary hypertension, in particular, was associated with marked activation in this system (Ann Intern Med. 1991;114(6):464-9). This work culminated in a New England Journal of Medicine report that identified marked upregulation of activity of the endothelin system in this condition (N Engl J Med. 1993;328(24):1732-9). This work provided the scientific basis for the introduction of novel endothelin receptor antagonists in the treatment of pulmonary hypertension, which has now become a cornerstone of the clinical therapy. His laboratory was also one of the first to recognize the pivotal role of endothelial NO-synthase and NO in angiogenesis and endothelial repair (Circ Res. 1998;82(9):1007-15), acting as a downstream mediator of the actions of many potent angiogenic factors. This work has shed light on several important clinical caveats, including the impact of endothelial dysfunction on the responsiveness of patients cardiovascular diseases to angiogenic interventions. As well, he described a previously unrecognized vascular phenotype in endothelial NO-synthase mice, resulting from impaired angiogenesis in the developing pulmonary arterial bed (Circ Res. 2004;94(8):1115-23), resembling a lethal form of persistent pulmonary hypertension of the newborn. He was also the first to identify the role of NO in the action of angiopoietins, a newly discovered angiogenic pathway that mediates vascular maturation and stabilization (Am J Pathol. 2003;162(6):1927-36). His work in the basic mechanisms of angiogenesis spurred an overarching interest in translational research: “From molecules to medicine”. He led the first Canadian clinical trials to explore the efficacy of angiogenic gene therapy in the treatment of patients with severely symptomatic coronary artery disease, including the REVASC (Gene Ther. 2006;13(21):1503-11) and NORTHERN trials (Mol Ther. 2009; in press). He has pioneered the use of endothelial progenitor cells (EPCs) to repair and regenerate damage lung arteries as a novel treatment of pulmonary arterial hypertension, a lethal condition that targets the young. Based on compelling preclinical results (Circ Res. 2005;96(4):442-50), he is now spearheading the world’s first cell based clinical trial, the PHACeT trial, using genetically engineered EPCs for patients with refractory pulmonary hypertension. As well, he is now poised to launch the first “enhanced” cell therapy trial for cardiac repair post myocardial infarction (ENACT-AMI), designed to overcome the deleterious effects of host cardiac risk factors on the regenerative activity of autologous progenitor cells. Recently, his laboratory has provided novel insights into the therapeutic potential of mesenchymal stem cells (MSCs) for the treatment of acute lung injury and acute respiratory distress syndrome (ARDS) (PLoS Med. 2007;4(9):e269). There are currently no effective specific therapies for ARDS which is responsible for a substantial burden of mortality and morbidity in critically ill patients, and he is currently leading a Canadian effort to initiate the World’s first cell therapy trial for this condition. In his research and administrative roles, Dr. Stewart has demonstrated leadership in bringing diverse groups of clinicians and scientists together from across numerous institutions, to put Canada of the World stage of translational cardiovascular research. He has published almost 200 peer-reviewed manuscripts and is on the Editorial Board of prestigious scientific journals including Circulation Research. He has patented several novel gene-based approaches to the therapy of cardiovascular diseases, specifically, a new cell-based gene transfer technology for the treatment of pulmonary hypertension which is now entering early clinic development. 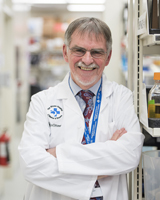 He has received a number of distinctions and prizes in recognition of his important academic contributions, including the Research Award for the Department of Medicine of the University of Toronto in 2003, Dexter Man Chair of Cardiology of the University of Toronto and the Leishley Chair at the University of Ottawa.